On May 14th, I followed some Chipping Sparrows and Clay-coloured Sparrows into the woods of Emily Murphy Park. When I lost track of them, I continued on the trail, scanning the surrounding trees and shrubs for other feathered creatures. Spring was still springing, and the tiny, new, wrinkled, light-green leaves had yet to become hiding places for the forest birds. 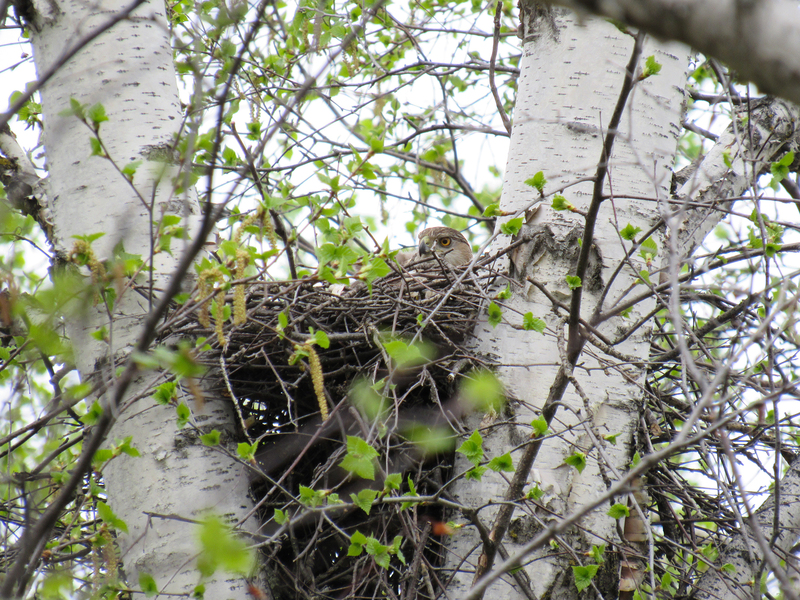 So it was easy to spot a Cooper’s Hawk nest in the four-pronged fork of a large birch tree. On May 26th, the leaves had gotten much bigger. 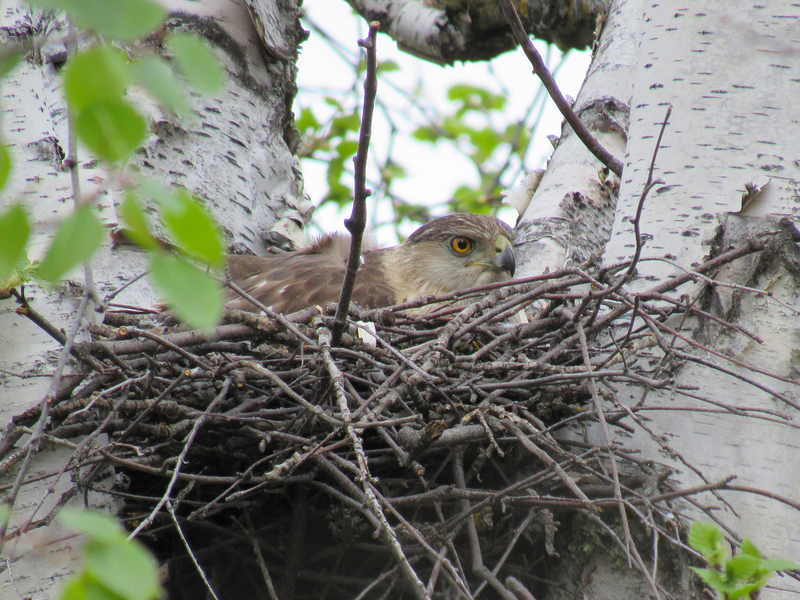 On June 4th, I was hoping for chicks, but Mrs. Cooper was still sitting patiently on her eggs. 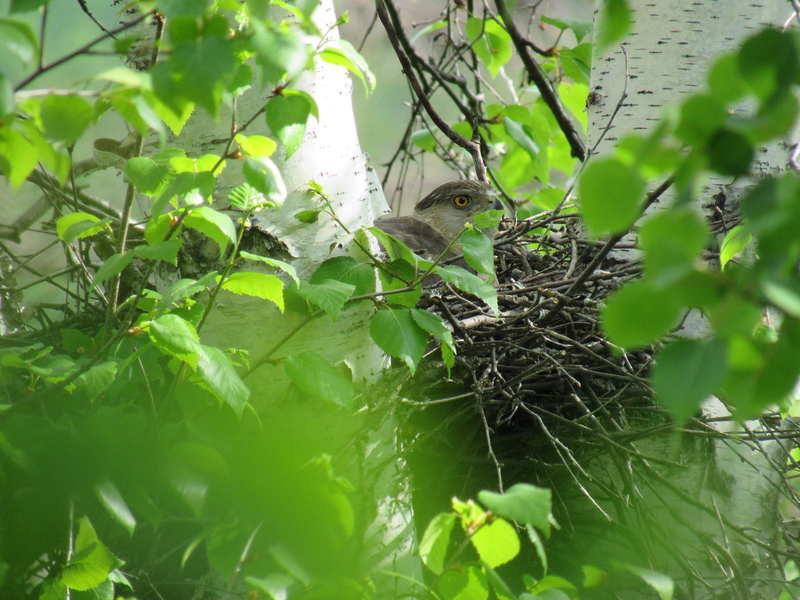 On June 27th, Mrs. Cooper was standing in her nest. Different! The small tree branches and their leaves were dancing wildly in the wind, so in each photo I took, the leaves were in different places. A few photos were just green blurs. There seems to be a little white down in the nest. Oh! There seems to be a lot of white down in the nest. I would have to wait until another day to see little dark-grey eyes. I always feel privileged when I gain a glimpse into an occupied nest. How extra special that you were able to monitor it over time. I look forward to part 2. Thanks for your comment, Tanja :-). Sorry I took so long to respond. 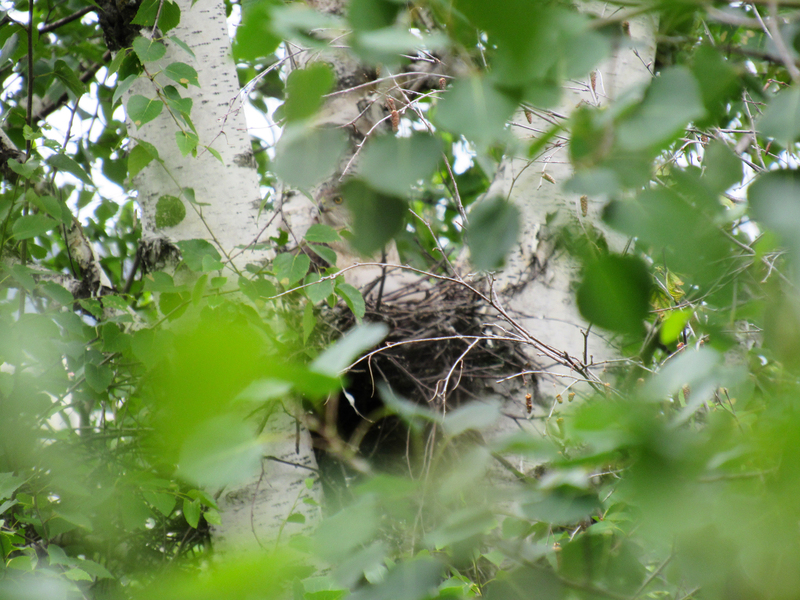 I’m so glad you enjoyed the photos and related to the sweet and uncommon privilege of catching a glimpse of an active nest. I suspect part 2 will appear in the next few weeks! How wonderful that you spied her and at nesting time too! I’m looking forward to part 2 and chicks! 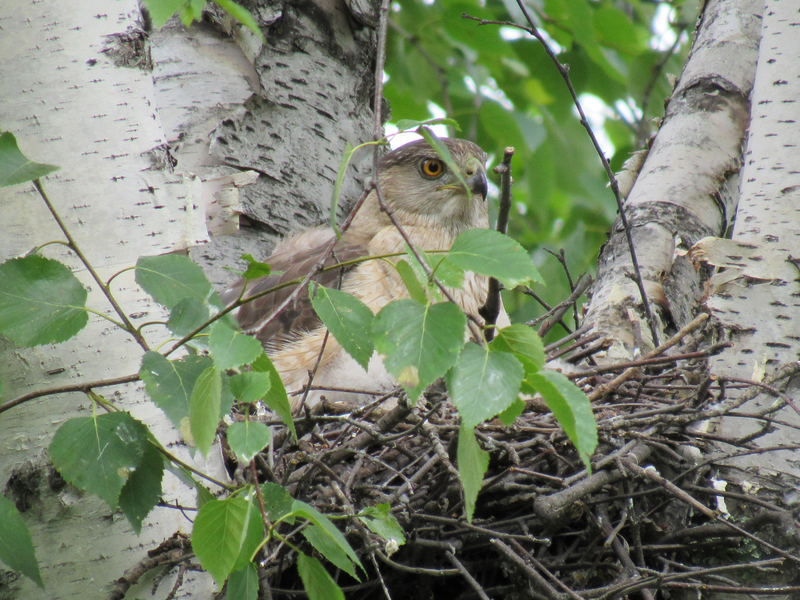 Thanks for enjoying this hawk nest post, Deborah! 🙂 Sorry for spacing out on my blog for oh-so-long! Maybe part 2 will appear before the end of the year. Hope so! I know how life gets in the way of blogging and reading them! So exciting! We have a cooper’s hawk hanging out in our neighborhood which I find thrilling but I keep a close eye on my puppy! Pete has topped out around 8 lbs, very small for a westie. Coopers could easily have taken him when he was younger. We also have redtails in the neighborhood, and they definitely could. In fact, I’m working right now on a painting of one who thought about it and only at the last moment noticed me standing there with a leash attached to his intended lunch! Boy, was he indignant! Yes, soon I hope. My son and his friend moved all of the stuff from the gallery to my home studio on Saturday, and now I’ve got some work to do setting it all to rights and digging out my easel. Oh, did you decide not to stay in the gallery? I just noticed that you sell prints on your Facebook page. I can’t afford an original, but a print! Are your other paintings available as prints too or just those on Facebook? I have found a printer who does nice work and so yes, if I have a photo of a painting I can have it printed and matted. I plan to sell them for $25, with maybe a couple of dollars for shipping. Was there one you have in mind? I did decide to let the lease go. The space didn’t generate enough extra income to even cover the rent so it didn’t make sense to keep it going. I thought it was just me but other shop owners have said it is the same for them. People don’t even window-shop anymore, let alone come in. Sorry to hear the gallery didn’t work out. It was so pretty! I guess it is more convenient to buy art online these days? Art fairs seem pretty popular too. I’m super fond of your Rollins Prairie Restoration painting. Magical! And your price sounds super reasonable for my tiny wallet. Oh, I know, it feels a shame to be closing it down. I guess people have just changed the way they do things. You’re right about art fairs~that works pretty well too. No worries on the late reply! How is school going? I don’t get the chance to read much either these days. Yes, this is Pete’s first winter and so far he is taking it in stride. I bought him a little red and black plaid coat and he wears it gleefully, tail in air. I must get a picture and post it. Thank you, and you as well! Unfortunately, school didn’t work out. They gave priority to applications from students without a Bachelor’s degree regardless of grades. And I haven’t come up with a Plan B yet. But hopefully I’ll come up with something good soon 😊. Pete’s winter coat sounds adorable. I hope you do post photos!!! Oh no! I’m so sorry to hear that. They are missing a really good person by excluding you. It infuriates me to see the misguided direction schools are taking these days. Aw, that’s so sweet of you to say :-). Maybe there is a good reason for their decision. I suppose…perhaps the Universe has something even better planned for you. You could totally sell your artwork~ it is lovely. There is that one you did, in pencil….I love it! Hypothetically, how would you price the pencil bird drawing you like? I’m thinking somewhere between 80 and 100 Canadian dollars ($60-$80 US). It is 9 by 12 inches. For the original, I’d sell it for $80 US. You could have prints made of it and I think they would sell briskly for around $25US. I’m looking into doing this myself right now, and sourcing mats and bags to wrap them in. A website to look at is Clearbags.com. I believe your skills and “eye” are already there (although of course, we artists are always trying to grow!). The main thing is that the art should be from your own photos. So, let’s see. Then you’d need a way for people to pay, such as PayPal. I quite like that…is it available in Canada? I think you can do all this right from your blog if you buy that package, or you can go to a place like Zhibit to create a website. It is easy, I promise! I understand that Etsy has come a long way, as well. You’re very kind, saying those things. Thank you! As you say, it all happens with baby steps. Be kind to yourself, take your time,and know that you truly have talent and deserve to receive money for your wonderful artworks. Thanks for all your advice, Melissa. I appreciate your generosity! Sorry for the late response, I think I’ve been in a cocoon of anxiety and self-doubt. Oh my! I haven’t heard of Clearbags, but I’ll check it out. If I ship my prints or originals myself, how I do it is definitely something to consider. Have you looked at Society6 or Zazzle? They print artwork on all kinds of merchandise. They do the printing and shipping, which makes things easier for the artist, but I suppose the artist makes a bit less money and also cannot control the printing and shipping process. As for Paypal, I think there is an option to add a button to one’s WordPress site. I’m glad you brought up using my own photos. It is so easy to be inspired by other people’s photos! But ethically and legally, it is easier to use my own. Also, it gives my drawings a more personal feel. I’ve pondered a bit, and I don’t want to focus too much on selling my art yet. I feel that I have a lot to learn and explore, and thinking about selling seems to increase the anxiety I have about learning and exploring. It is interesting though to think about sellable art. It makes me think about a visually pleasing layout… creating something which has a pleasing visual impact for me or for others. I made 2 posters and a T-shirt for my sister recently. While I was drawing and laying out the text and drawings, I gave her a lot of space for input. It was interesting and different for me to create something that was a combination of both our visual ideas. Thanks for your evaluation of my drawing and prints. And I’m thrilled that you will be selling prints of your work! Hugs back! I admire how you are thinking things through. I just plunged in, and find I am still figuring things out now. LOL! I must admit I was overwhelmed :-). I’m sure you guessed. I read “Eat Pray Love” a while back and loved it, but I haven’t read “Big Magic”. I’ll look for it. I’m glad you brought that up – “while it is possible to make a living from art, one shouldn’t expect it… just enjoy making wonderful drawings”. And wonderful drawings don’t always have to be amazing… they just have to be full of wonder… which means… they’ll occasionally be amazing… if the wonder stays alive. I thought about what you said, and for me, it means continuing to create drawings or paintings that are meaningful to me, continuing to notice the cool stuff that other artists are creating and why I think its cool, mixing the two, but always remembering where my heart lives. Are you planning on selling prints with mats? I noticed while print-browsing that a few artists mail prints in tubes. I guess that prints with mats get mailed flat? Well it would be an honor to have the original. I would not spray it. I think the covering you have will work just fine, and then slipped into a plastic covering and shipped flat. Will a check be alright? Let me know your address and I’ll send it along. Are you applying at a different university? I hope you have better results this time. I thought the last one gave you such a disappointing response. So I think I’ll send a check for $40 and then one of my prints, because otherwise it wouldn’t be a fair trade. Does that sound ok? Sending the drawing in late Feb or early March would be great. Hopefully the weather will be better by then! I bought mats with plastic sleeves from Amazon and am really pleased with them. I’ve just ordered another batch of prints, so for an upcoming show I’ll have two different prints I can offer. I’m just doing a little at a time as I can afford to. I haven’t looked at shipping costs yet for shipping them flat, but I don’t expect it to be all that much. Even though you are selling me the original, you can still have it made into prints anytime in the future. I think it will sell well for you. I’m pleased to hear that you are happy with your prints, mats and sleeves. Exciting! Which two paintings are you printing? Was it a bit of a process to get the printed colours to come out the way you wanted them to? Some years ago getting the color right was a problem but I’m finding that with digital images the printer gets it right first time. What an improvement! So far I’ve had Grant Woods Meander printed, and the latest one, with the skipper. That’s very cool – lucky you for discovering the nest! 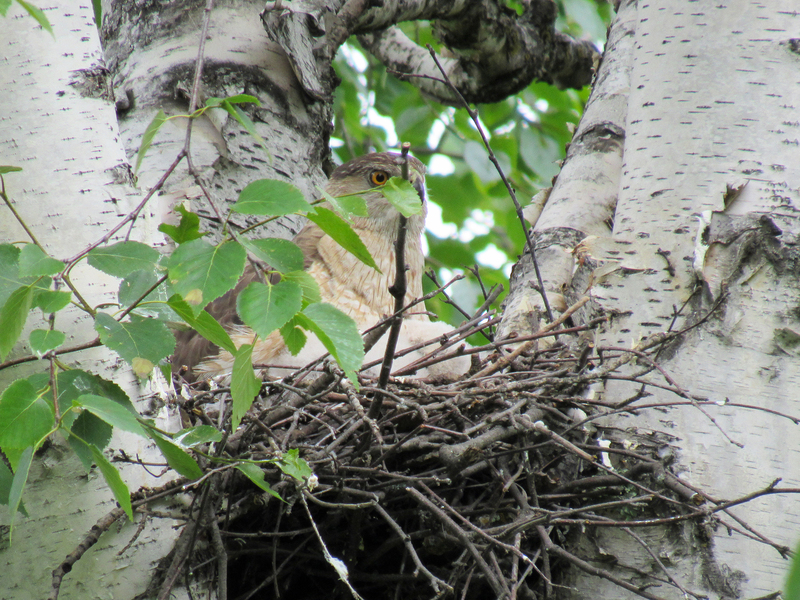 I discovered an adult Cooper’s Hawk on our property (north of Calgary) in July this year. 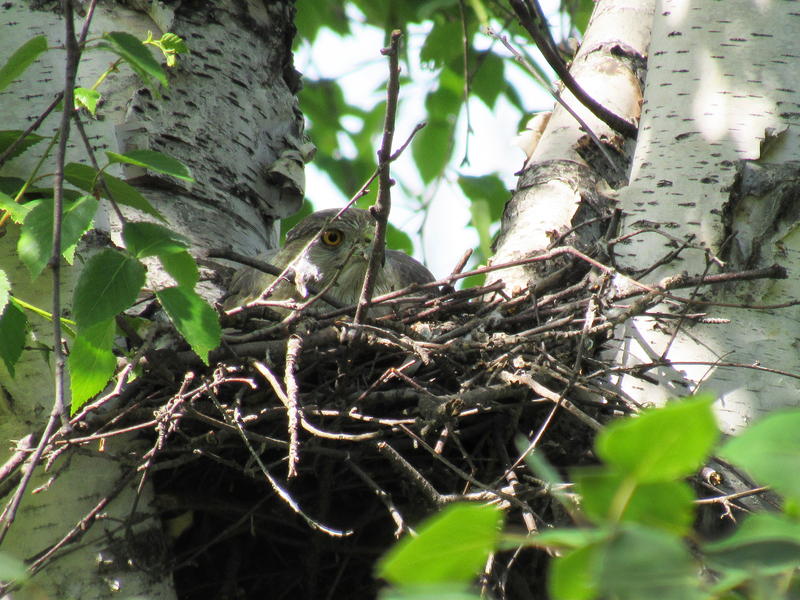 Shortly after that, a Cooper’s hawk fledgling appeared. I never saw more than one fledgling at a time, so assumed there was only one! We also had at least two Great Horned Owl fledglings on our property (4 acres) – it was certainly a good summer to watch them! Of course, it also meant the robins and a number of other birds that size were visibly absent from our woods. Beautiful photographs and a beautiful sequence …. so happy to see how it turned out! Thanks very much for your kind words, Carol. 🙂 I hope to add a little more to the tale of the Coopers soon.